Plan to stay at one of several affordable hotels near New Orleans Port, before or after your cruise ship vacation. 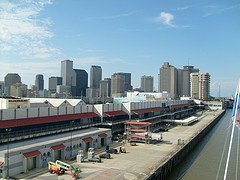 Luckily for you, the New Orleans cruise terminals are located in the downtown area, not far from the famous New Orleans Convention Center. Due to its proximity to the Convention Center, there are many hotels near New Orleans Port, and many attractions from which to choose. Port of New Orleans Physical Address is: 1350 Port of New Orleans Place, New Orleans, LA. Julia Street Cruise Terminal, Port Of New Orleans Place, New Orleans LA 70130. New Orleans' Famous Riverfront, the River-Walk Shopping Mall, the Arts District, the Aquarium, Mardi Gras, Great Cuisines, Music - lots of it, Festivals, the historic French Quarter, and Cultural Arts. I have just scratched the surface - there is much more to see and do in New Orleans. You may get additional information on each attraction here. This hotel is within walking distance of the historic French Quarter, Bourbon Street, Harrah’s Casino, the Louisiana Superdome, the Ernest Morial Convention Center, and the Audubon Aquarium. The Country Inn & Suites French Quarter New Orleans offers complimentary breakfast. This hotel is only 13 miles from the New Orleans International Airport and the New Orleans Cruise Terminals are nearby. Similarly to the Country Inn & Suites, this hotel is located in the historic French Quarter with close proximity to Bourbon Street, the Morial Convention Center, the Louisiana Superdome, the New Orleans Fairgrounds and Race Track, Aquarium of the Americas, the Riverwalk Marketplace, and Harrah’s Casino. Guests will find a host of dining, shopping, and entertainment venues nearby. 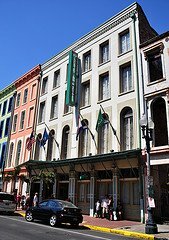 The Holiday Inn French Quarter Chateau Lemoyne is 15 miles from the New Orleans International Airport and a short distance from the New Orleans cruise terminals. 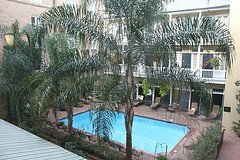 Doubletree Hotel New Orleans: Find the best deal, compare prices, and read what other travelers have to say..
Whitney Hotel - A Wyndham Historic Hotel: Find the best deal, compare prices, and read what other travelers have to say. BEST WESTERN PLUS St. Christopher Hotel: Find the best deal, compare prices, and read what other travelers have to say. Sheraton New Orleans Hotel: Find the best deal, compare prices, and read what other travelers have to say. International House Boutique Hotel: Find the best deal, compare prices, and read what other travelers have to say. 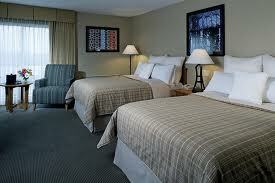 If you still have not found the right hotel for your family, use the TripAdvisor search box below to help you. Cruise passengers fly into the Louis Armstrong New Orleans International Airport (MSY), which is about 17 miles or 45 minutes from the cruise terminal. Note: All rates above are subject to change. For those who can drive to the port, there is parking available for your vehicle. A daily fee per vehicle is assessed. There you have it. I have given some pertinent information to help you plan your inclusive Caribbean cruise out of New Orleans. I hope that you will plan well and allow your family to enjoy that historic and lively city, by choosing to stay overnight in one of several affordable hotels near New Orleans Port.